Some of the items going under the hammer at Edenhall nr Kelso. Sylvia Loch is selling up her house and some of the contents are being auctioned later next month. Seen here with two Turkish swords her husbands side of the family owned. Turkish cavalry swords and a first edition of Ian Fleming’s The Spy Who Loved Me, are among 325 lots to be sold at a forthcoming sale near Kelso. The 19th-century Eden Hall, east of Kelso, is currently in the process of being sold after being marketed for £990,000. For more than 18 years it has been the home of internationally-renowned dressage expert, horse trainer and author, Sylvia Loch. 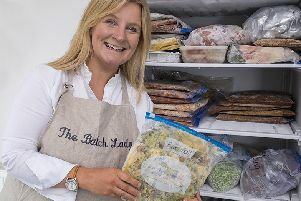 However, following the death of her second husband – leading environmental lawyer Richard Hawkins – last summer, the former Lady Loch has decided to downsize and move to Suffolk to be near her daughter and family. But before she can leave, she has to dispose of much of the contents of the seven-bedroom Eden Hall, which, with its 26 acres and stables, she had turned into a world-class riding school that attracted people from around the world. As well as the aforementioned lots, the auction to be held on Saturday, March 7, at Eden Hall itself, will also include furniture, paintings, glassware, wine, garden furniture and many items to do with equestrianism. “It will be terribly sad to leave, but it’s far too big a place now for me to be rattling about in by myself,” said Sylvia, whose first husband was the late 3rd Baron Loch of Drylaw, a former cavalry instructor, whom she met in Portugal while in her 20s and who introduced her to the art of classical horsemanship. “It’s a big place and a lot of responsibility. But it’s been really lovely being based here and bringing people from around the world to ride with me and introduce them to the beautiful Borders. The auction will be conducted by well-known firm Railtons, and Lady Loch is hoping it will attract a good crowd. There will also be a bric-a-brac sale at the same time, in aid of the dog rescue run by Sylvia’s daughter, and the proceeds from the vintage clothing sold at the auction will go to local churches.